One of the poorest areas in Rotterdam, and in all of the Netherlands, Crooswijk has always been a working-class neighbourhood. Over the years Crooswijk has absorbed many migrant communities, like Brabanders in the early days, and Moroccans and Turks in the ’60s and ’70s. Today there are many cars with Bulgarian, Polish, Serbian and Ukrainian number plates in the streets. Built in 1877 as an urban mansion, this is one of the oldest houses in Crosswijk, and it was a workers pension since the 1920s. In 1954 it was re-styled by the owner, Mr. Koers, as Burgerhotel De Zon, a shelter for the homeless, men that had it rough even by the standards of this poor area. This was not a hotel you’d choose to go to. It was a last resort, with 75 bunk-beds and probably the scene of many petty dramas. Wiebe Koers, the son of the original owner, used to run the place until 1990, when the city took over. A few years ago Burgerhotel De Zon was finally closed, and is since waiting to be transformed into luxurious apartments. Crooswijk is still a working-class neighbourhood, but it is changing rapidly. As Rotterdam is booming, property prices are rising fast. Whole street-blocks of old, crumbling houses are torn down to make room for spacious apartments or family homes. 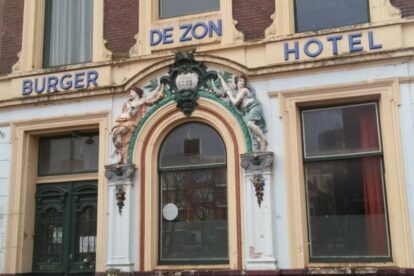 Fortunately, Burgerhotel De Zon, with its ridiculous facade and Dickensian vibe, will remain as a living memory to the origins of Crooswijk. The dead memory is nearby, too – at the Crooswijk Cemetery.